A total of 35 common garfish, Belone belone (Linnaeus, 1761), were studied for metazoan parasites on their spawning grounds in the western Baltic Sea. 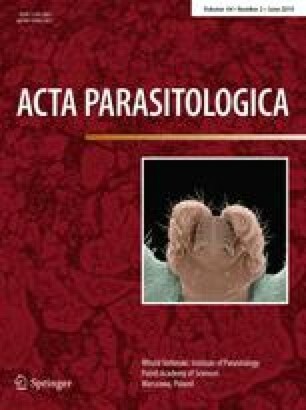 Nine parasite species were found, and six new locality records could be established for German coastal waters (Axine belones, Monogenea; Proteocephalus sp., Cestoda; Anisakis simplex (s.s.), Contracaecum rudolphii A and Hysterothylacium aduncum, Nematoda; Echinorhynchus gadi, Acanthocephala). For the first time, the marine ectoparasite A. belones was recorded from the gills of garfish inside the Baltic Sea, indicating its ability to survive the spawning migration as well as the brackish water conditions at its reproduction grounds. This is alike the endohelminth A. simplex (s.s.), that was identified by molecular analyses of the internal transcribed spacer (ITS-1, 5.8S, ITS-2) region. Almost all isolated metazoans were parasites commonly recorded from the northeast Atlantic Ocean and the North Sea. The lower number of typical generalist Baltic Sea parasites indicates the rapid migration of common garfish onto the spawning grounds, reducing the access and uptake of these species.